Scaffolding obscures the ground floor (and tarps cover the top floor) as interior renovations continue in 2014. In 1855 the 44-year old Raymond W. Townsend formed, with two other attorneys, the firm of Townsend, Dyett & Raymond. Townsend’s close association with Anthony Rainetaux Dyette would last for nearly half a century until Dyette’s death in 1898. While the third name in the firm’s title would change twice, the partnership of Townsend and Dyette remained fast. A decade after the firm was established, the partners had made substantial fortunes. With the surrender of General Robert E. Lee on April 9, 1865, New York City workers who had been fighting for the Union began returning home. Soon construction projects resumed and the streets branching off Central Park saw rampant development. Manhattan’s millionaires were still firmly rooted on Fifth Avenue below the park; but the wealthy merchant class was lured to the Upper East Side’s tranquil streets. Randolph Townsend and his wife, Jane, moved into a fine brownstone home at No. 18 East 73rd Street in 1866. Four stories tall above an English basement, the comfortable house was quite like the others that lined the block. With the couple was Mary, Jane’s daughter from her previous marriage to Cephas H. Norton who had died in 1860. Two years later a son was born, Randolph W. Townsend, Jr. There would be two more children in the family—Harmon and Emma. Randolph continued to prosper and sat on the boards of several corporations, including The Importers and Traders’ National Bank of New-York. The family was grief-stricken when, on Friday morning, March 26, 1886, 18-year old Randolph Junior died in the house. His funeral was held in the parlor at 4:00 the following Sunday. Eventually the girls married, leaving their aging parents alone in the house with the servants. Just before the turn of the century, Randolph suffered a stroke that left him partially paralyzed. Until then he had been carrying on his legal practice at No. 247 Broadway as he had for 45 years. For three years he would suffer from serious illness. For the summer season of 1902 Randolph and Jane leased the cottage of Chancellor MacCracken of New York University. On June 15 the 91-year old attorney died there. The New-York Tribune attributed his death to “general weakness.” For only the second time since 1866 the doorway to No. 18 East 73rd Street was draped in crepe as guests filed into the house for Townsend’s funeral the following Wednesday, June 18 at 4:00. In the summer of 1908 the Wilmerding family was leasing the Townsend house while Jane was traveling abroad. On June 25 the residence was the scene of a society wedding as Caroline Murray Wilmerding was married to John B. Trevor. The social importance of the match was reflected not only by the fact that Robert Walton Goelet the best man; but by the names on the guest list. Among them were Mr. and Mrs. Franklin D. Roosevelt, Mr. and Mrs. Harrison McK. Twombly, Mr. and Mrs. Theodore Frelinghuysen and Robert Bayard Cutting. In the meantime, Jane A. Townsend was spending time at Holbrook Grange, near Rugby, England. It was here, on August 20, 1908, that she suddenly died. Since Randolph’s death she had generously donated to charitable causes, many of them educational. The reading of her will a month later would reveal substantial bequests of a similar nature. The $50,000 endowment she left to Yale University would amount to about $1.25 million today. “The bequest is to endow a professorship of history in memory of Randolph W. Townsend, Jr.,” explained The Sun. The newspaper added that Jane had also left $10,000 to the rector of the Episcopal Church of all Angels, $15,000 to the Presbyterian Hospital to endow three free beds in perpetuity. The Presbyterian Home for Aged Women received $34,500; and $10,000 each went to the Presbyterian Church on University Place and the New York Exchange for Women’s Work. Of Jane’s five children, only the widowed Mary Perkins was still alive. 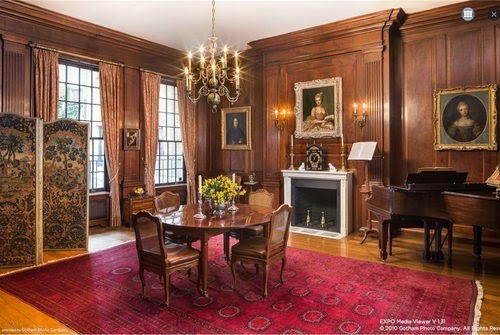 Following the distribution of her mother’s generous philanthropic bequests, she received the bulk of the estate; including the 73rd Street house. Mary kept the house, deciding to lease it to upscale tenants. Although, by now, the block was undergoing tremendous transformation as the outdated brownstones were razed or remodeled, Mary kept the family home as-is. 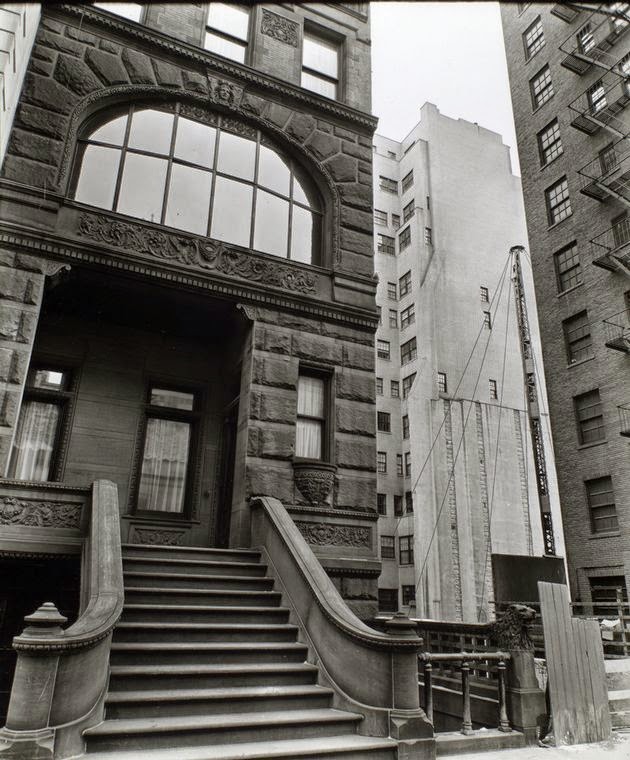 It stood in stark contrast to the magnificent Joseph Pulitzer palace almost directly across the street and other lavish mansions on the block. Passersby have to wonder what is going into the blue-tarped dumpster. Following the Wilmerdings, the family of Edward R. Stettinius moved in. Stettinius was known as a mover-and-shaker in corporate America, having already reorganized the Sterling Company and the Diamond Match Company. In January 1916 he was admitted as a partner in J. P. Morgan & Co.; brought into the firm to organize its new purchasing department for the British Goernment. Two months earlier, his wife had begun the string of entertainments in the house for their daughter Isabel’s debut. When Isabel later married Major John B. Marsh on November 19, 1919 General John J. Pershing was in attendance. 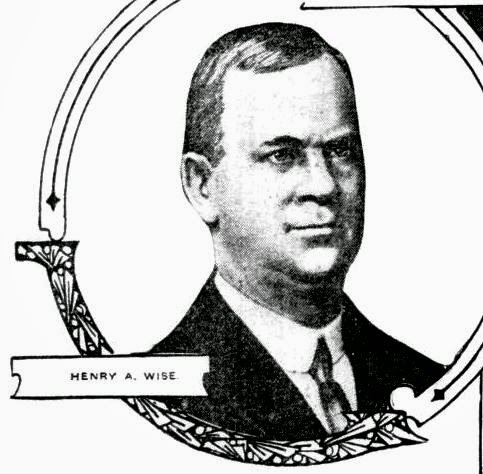 The mystery purchaser was eventually identified as Henry A. Wise, former United States District Attorney for the Southern District of New York under Presidents Taft and Roosevelt. The modern-thinking Wise and his wife would not move in before changes had been made. They commissioned architect William Lawrence Bottomley to completed redesign the dated brownstone. A month after the purchase, plans were filed for extensive alterations. The Record & Guide estimated the costs to be about $15,000 (around $200,000 today). In September 1922 the newspaper was more detailed in the changes to be made. The renovations would entail removing the façade and replacing it, removing interior walls, and installing new “laundry, partitions, stairs, dumbwaiter, fireplaces.” By now the estimate of costs had risen to $22,000. The completed Wise house was unlike the limestone and marble-fronted confections around it. These had been designed, for the most part, in the early years of the century when the Beaux Arts style was the rage in residential design. Bottomley had produced a prim five-story neo-Georgian home of red brick with extremely restrained ornamentation. The high stoop was gone and the entrance was lowered to sidewalk level. Splayed lentils of matching brick were nearly invisible; the only decoration of the lower floors being handsome keystones at the second story carved with Georgian-style urns in bas relief. A limestone cornice supported a stone balustrade, behind which a slate-tiled mansard provided for three straight-forward dormers. The Wise children received a privileged upbringing. The family summered in their estate in Kiptopeke, near Cape Charles, Virginia. Daughter Eva attended the private Brearley School in New York, then traveled to Florence, Italy to Miss Nixon’s School. Upon her return she studied at Bryn Mawr College. Her brother John graduated from the Virginia Military Institute before becoming a lawyer like his father. The year 1932 would be momentous for the family. On May 28 that year Eva’s engagement to Alfred Slade Mills was announced, and just four months later John’s engagement to Elizabeth Ridgely Thompson was made public. With the house now empty of children, the Wises soon moved on. It was owned by Marie A. Spear until April 1945 when she sold it to Lt. Colonel James E. Fitz-Gibbon. In reporting on the sale, The Times noted the home’s impressive neighbors. “Other residences in the same street and neighborhood are the former Pulitzer mansion, and the homes of Mrs. Edward Van Ingen, H. Lester Cuddihy and George Doubleday.” Fitz-Gibbon was less impressed. The newspaper said he “intends to remodel the building into small apartments and occupy a suite there.” Before the end of the year the mansion had been divided into two apartments per floor. As the 20th century drew to a close the former mansion was owned by George and Antonia Pavia. The attorney was a partner in the Pavia & Harcourt law firm and it was he who hired Sonia Sotomayor when she left the Manhattan District Attorney’s office. The couple would regret signing a lease with James Couri who later accused his landlords of neglecting problems and hiding the building’s rent stabilized status. Couri’s more-than-odd behavior (in 2002 he wrote a letter to George Pavia which said in part “Your father was a fascist sympathizer and you were a member of the Mussolini-Fascist youth corps during pre-World War II) and litigious bent resulted in nearly 15 years of legal wrangling. Eventually, even though Couri told The New York Times “Pavia has a much a chance of evicting me on a nuisance charge as I do of waking up in the morning as Prince Charles,” he was evicted and the Pavias put the house on the market. Because the house sits within the Upper East Side Historic District, no changes can be made to the exterior. Hopefully the “gut renovation” of the interiors involves only the 1945 partitions; but that is most likely an optimistic hope. In 1899 the march of commerce up Fifth Avenue had changed much of the residential neighborhood around the massive Croton Reservoir between 40th and 42nd Streets. Yet the houses on the east side of the Avenue and the blocks between Fifth and Madison Avenues were still, for the most part, private residences. That year the popular and successful actress Maude Adams purchased the brownstone house at No. 22 East 41st Street, paying $35,000—a respectable $950,000 in today’s dollars. Sitting above a high stone stoop, it was unusually narrow for the still-upscale neighborhood; only 12.6 feet wide. 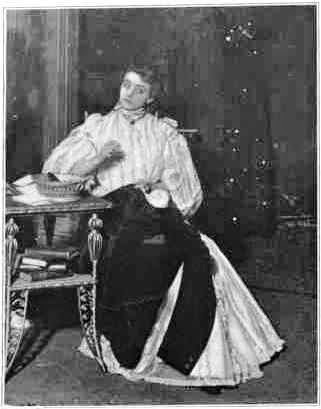 The actress, whose full name was Maude Ewing Adams Kiskadden, had begun starring in plays by J. M. Barrie two years earlier, including The Little Minister. Six years later she would introduce the playwright’s character Peter Pan to the New York stage. It was her most memorable role and contributed to her being the highest paid performer of the day—earning over $1 million a year at one point. Not oblivious to the changes, when her next door neighbor, Mrs. Emma A. Streeter, put No. 24 on the market in January 1905, Maude Adams snapped it up. “With the recent demand for new building sites on Fifth Avenue…real estate men say that Miss Adams’s purchase giving her control of a frontage of 25 feet is a shrewd speculative move,” said The New York Times on January 11. George & Edward Blum, the same architects responsible for the 20-story office building, would design the structure to replaced Maude Adams’s houses. Both buildings were encased in terra cotta—but the similarities stopped there. The architects surrounded the central portion of No. 22-24 in an oversized-picture frame. The tiles here and in the window sprandrels reflected the popular Art Nouveau and Arts-and-Crafts styles of the period. .
Each floor was flooded with sunlight from the expansive windows. Like its big brother next door which announced “No Manufacturing Allowed,” the building would preserve the upscale tone of the street by leasing to salesrooms. The building was fully-occupied in 1915 when the store and basement were rented by the Defiance Manufacturing Co., sellers of architects’ supplies and drawing materials. The following year Maude Adams decided to liquidate the property. On December 27, 1916 the New York Clipper announced that she had received $703,000 for the building. The actress walked away with what would amount to about $14.5 million today. The 1920s saw similar tenants in the building. Pincus I. Rosenblum, “merchant tailor,” moved in in 1922 and the Standard Gas Equipment Corp. was here by 1926. In 1922, however, there was a terrifying turn of events. When the Holland Holding Corp. constructed the two buildings, they included a joint vault underground used for storage. The Alliance Bleacheries Company stored concentrated acids and chemicals there. Large carboys contained caustic substances like sulphuric and muriatic acids, and were kept in the vault behind closed doors. Improperly sealed, the large bottles began seeping fumes. The men worked in relays, each man having his oxygen tank refilled at each rest period. The “powerful acid fumes quickly exhausted the oxygen supply carried,” explained the newspaper. As pedestrians crowded onto East 41st Street to witness the work, they were quickly repulsed by the pungent fumes. The firemen and rescue squad worked for two hours attempting to air out the building; but found that the fumes merely spread again. It was then that a large tank containing about 220 cubic feet of chlorine gas was discovered leaking in the vault. In what today might be considered a rather environmentally unfriendly move, Deputy Fire Chief Joe Martin ordered that the tank be dumped into the East River. The Depression years saw the building still occupied. The New York Office of Philadelphia-based Adrian Bauer Advertising Agency was here in 1936. A year later the century-old stationery firm H. K. Brewer Co purchased the building and established its permanent uptown headquarters here. And in 1939 women’s wear retailer Frances Antonier took the second floor. The unbelievably intricate terra cotta designs incorporate a mixture of styles. Two years before the Adams ad appeared in New York magazine, Patrick Cooney arrived in New York from Ireland. His street level restaurant, O’Casey’s would leave its mark on the Blum brothers’ design. O’Casey’s still operates behind a faux Irish pub front. While its dark wooden façade is immensely preferable to the plastic signage and metal storefronts of delis and electronics shops; it is hard not to wish the delicate terra cotta structure had survived intact. A decade after speculative builders had lined the blocks branching off Central Park with identical and monotonous brownstone rowhouses, the 78th Street block between Fifth and Madison Avenues was still mostly undeveloped. In 1871 Silas M. Styles had erected three such homes; but nothing further would happen on the block until the 1880s. When architect and builder Edward Kilpatrick purchased the 23-foot wide plot at No. 4 East 78th Street, he intended that this home would stand out. The Queen Anne style was on the cutting edge of residential design and No. 4 would embrace it with passion. Kilpatrick began construction of the home in 1887 and when completed in 1889, it had all the architectural bells and whistles expected in the fanciful style. A dramatic, sweeping stone stoop rose to the asymmetrical entrance floor. Three levels of rough-cut brownstone, including the basement, were surmounted by a story of red brick with brownstone trim. A steep mansard with a copper-clad dormer capped it all. As attention-grabbing as the off-set porch was; it was trumped by the broad arch of the second floor. A mid-century photograph shows the arch filled with glass panes—if these were original, this area may have been intended as a conservatory of sorts. As construction neared completion, on January 5, 1889, the Real Estate Record & Builders’ Guide reported that Kilpatrick had sold the house to “Fannie wife of Arnold Falk.” The Falks took out a mortgage of $24,000 on their new home, about $590,000 today. The Falks would not enjoy their upscale new home for long. Arnold died in Heidelberg, Germany on June 18, 1891. The house passed rather quickly through new owners. 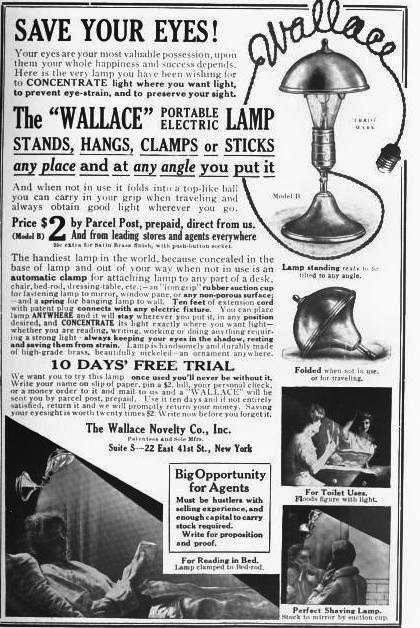 In 1895 it was purchased by Mary A. McLaughlin, whose husband was a police captain. He was placed under harsh scrutiny by the New York State Senate’s Lexow Committee that same year. The committee was formed specifically to weed out corruption and graft within the New York City Police Department. Delicate carving rims the maw-like arch. Frederick A. Burnham, President of the Mutual Reserve Fund Life Association, purchased the home from the disgraced couple. He was as well known for his chess-playing abilities as for his business acumen. Burnham regularly appeared in newspapers reporting the results of chess tournaments. In April 1897 he sold the house for about $75,000. At the time the family of Jacob Dreicer was living at No. 118 East 64th Street. But before long they would move into the fashionable home off Central Park. The Dreicer name became synonymous with exquisite jewelry. In 1885 Jacob took his son, Michael, into the firm as a partner, changing the firm’s name to J. Dreicer & Son. Unpleasant publicity came to the family towards the end of 1897 when daughter Mary (known as Mamie) filed for divorce from her husband, Max Lasar. To make matters even messier, Max, a diamond dealer, was arrested for smuggling, and $100,000 worth of unset diamonds seized on December 3. Then on February 21, Mary Ryan, a servant in the Colfax house at No. 9 East 78th Street, was startled by two men on the roof of a three-story extension behind the mansion. She threw open the window and demanded to know what they wanted. So Mary did. But later, when she happened upon Thomas Smith, a watchman for the gargantuan mansion of William A. Clark, she mentioned the encounter to him. Suspicious, Smith rushed back to the Clark house and up to the fourth floor where the art gallery bar had been tampered with earlier. He saw the beams of flashlights on the gallery roof and telephoned police. While police rushed to the mansion, the thieves were apparently scared off by Smith. In the meantime the Dreicers were entertaining in their home. The Dreicer’s butler, Henry Whitehead, who lived on the top floor, was busy with the reception. The burglars jimmied open a fourth floor window and made off with some of Whitehead’s clothing and a box of cigars. Police surmised they heard the voices of the people below and were frightened away before they could take anything of value. That year the Dreicers did renovations to the house. On September 30 the Record & Guide reported that they had commissioned architect Henry O. Chapman to add an apartment and one-story addition to the house at a cost of $2,500. As luck would have it, Walter Lasar went back to the house around dusk on May 30. When he reached the front door, he saw that the glass doorknob had been broken. Rather than enter, he rushed to Fifth Avenue and hailed a policeman. Officer Joseph Healy went inside, stationing Walter on the stoop. Floor by floor the policeman checked the house; finally hearing the sound of labored breathing and footsteps “of persons who obviously were struggling under a heavy burden,” reported The Sun. The young criminals were turned over to the Society for the Prevention of Cruelty to Children. The following year would be devastating for the Dreicer family. On July 26, 1921, Michael Dreicer was at his summer estate, Deepdale, formerly owned by William K. Vanderbilt, Jr. The 54-year old jeweler died unexpectedly that day. His father was deeply affected. Less than a month later, on August 14, the 82-year old Jacob Dreicer died suddenly in his Lawrence, Long Island summer house. The Evening World attributed his death to a broken heart. Living in the East 78th Street house with Gitel Dreicer were two of her three daughters and two grandsons. Mamie had retaken her maiden name of Mary Dreicer and interestingly enough, Walter also renounced name Lasar name, becoming Walter Dreicer. Frances was widowed. The population of the mansion was reduced by one in April 1922 when Frances’s son, Louis S. Davidson, married Alice Virginia Ansbacher in the Ritz-Carlton. The women lived together on East 78th until December 6, 1933 when Gitel Dreicer, 89-years old, died. The estate was divided equally among Mary, Frances, and their married sister Regina who lived at No. 270 Park Avenue. Walter Dreicer never married, living on in the in the house until his death at the age of 44 in October 1938. His funeral was held in the mansion on Thursday morning October 6. The brownstone carvings included seashells between the cornice brackets. A decade later the house was divided into large apartments, one each on the parlor and second floor; and two on each floor above. A doctor’s office was established in the basement. It was most likely at this time that the wonderful brownstone stoop was removed and a more commercial entrance installed at sidewalk level. Despite the tragic loss of the dramatic stoop; Kilpatrick’s robust design still makes a bold statement on the block among the more expected limestone-fronted mansions of the period. When nationalities world-wide began planning their pavilions for the New York World’s Fair of 1939, none could be prouder than Poland. Only two decades earlier, in 1918, Poland had finally regained its independence after 123 years of partition and foreign rule. Germany had done its best to stifle the Polish identify—outlawing the language, giving Polish-named towns German names, and teaching only German in the schools. But as the 20th century dawned, a fervent nationalism arose among the Polish people. Henryk Sienkiewicz dared to write Krzyzacy, a novel about the medieval roust of the Germans by the Poles in the 1410 battle of Grunwald led by King Wladyslaw Jagiello. 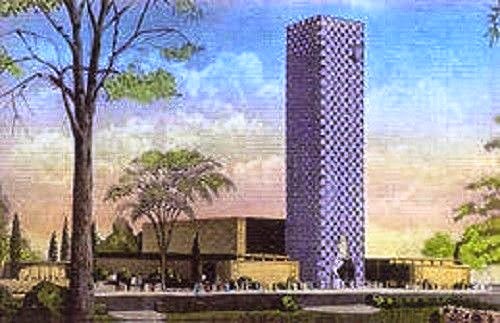 The Polish Pavilion in New York’s Flushing Meadows would be dominated by an architecturally fascinating tower of gold. The items on exhibition inside brought together the traditional and the modern; all a celebration of a reunited Poland. Perhaps as a not-so-subtle reminder to the Nazis who were increasing in power, the entrance of the Pavilion was guarded by a large statue of King Jagiello. A 1939 World's Fair postcard depicts the Polish Pavilion. Designed by sculptor Stanislaw Kazimierz Ostrowski, it was greatly inspired by the Krakow statue. But unlike that sculpture, which depicted the king’s arms at his sides, Ostrowski’s Jagiello raised his arms above his head holding the two swords handed to him by his enemies, the Teutonic Knights of the Cross. The crossed swords were symbolic not only of the defeat of the Germans; but of the king’s unification of Poland and Lithuania. The Polish Pavilion opened on May 3, 1939—the anniversary of the signing of Poland’s first Constitution in 1791. But although the country presented a joyous façade; while Polish girls danced in traditional dress and American tourists admired the exhibitions of art and culture, things were not going well at home. A year earlier Germany had annexed Austria and now it invaded Czechoslovakia. 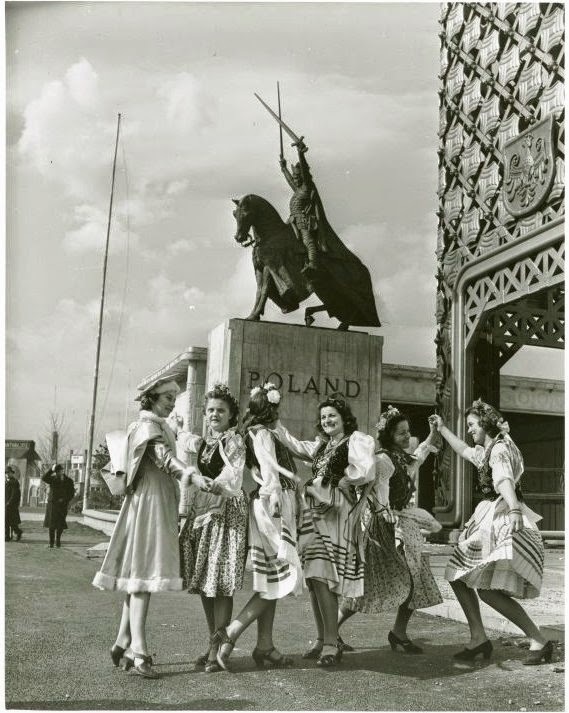 On September 1, 1939, four months after the World’s Fair Pavilion opened, the Germans invaded Poland. The move incited Great Britain and France to declare war on Germany. World War II had begun. Meanwhile at home, with the Germans advancing on Krakow, the citizens attempted to hide the Grunwald Monument behind a barricade of wooden planks. It was to no avail. The German Army dismantled the 60-foot high monument and the statue to King Jagiello was melted into bullets. Although the World’s Fair continued through 1940, the Polish Pavilion closed in 1939. The United States would not enter the conflict for another year; but while tourists and New Yorkers strolled the boulevards of the Fair the carefree atmosphere was much muted—especially so when they passed the silent pavilions like that of Poland and of Czechoslovakia. When the Fair closed Ostrowski’s defiant sculpture was presented to the city by the Polish Government. It was removed from its base and placed in storage. “A committee of Polish organizations, of which Mayor Fiorello H. La Guardia is honorary chairman, is raising $25,000 to prepare the site for the statue on the park lawn near the Metropolitan Museum of Art,” said Charles Grutzner, Jr. in The New York Times. Finally, on June 2, 1945 ground was broken in Central, west of the obelisk near the Metropolitan Museum of Art. The cornerstone was laid on June 17 and the unveiling took place on July 15. 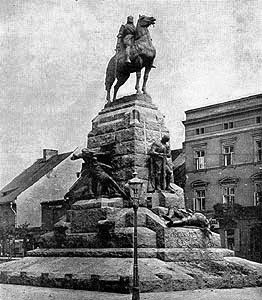 That the statue of a victorious King Jagiello over the Germans would be erected almost simultaneously with the end of German occupation of Poland did not go unnoticed. Despite the unspeakable atrocities endured by the Poles under German occupation—including the mass murder of millions—La Guardia’s declaration to “no power on earth could destroy the spirit of the Polish people” seemed to have borne out. The monument to King Jagiello in Central Park became a symbol of Polish nationalist, determination and pride. Banks of flowers, for decades, would appear on Polish holidays and patriotic anniversaries. In 1986, forty years after its unveiling, it was cleaned and restored by the Parks Commission. It happened just in time. In 1975 the city was shouldering $3.3 billion in debt and was on the verge of bankruptcy. Now, while the city was climbing out of the fiscal hole, it was still struggling. In 1987 there were only seven or eight workers to care for the 800 statues and 700 public monuments. They took home a combined salary of $175,000 a year. Twenty monuments needed immediate repair—at an estimated cost of $1.3 million. Among them was the statue of King Jagiello. The City was realistic. There was no way it could pay for the manpower and the cost of restoring the works of art. So it initiated the Adopt-a-Monument project; the sold program nationwide that sought private money to care for and restore individual monuments. The King Jagiello statue was one of the first two to be adopted. The American Conservation Association provided $30,000 to its restoration that year. As a result, the heroic statue with an amazing history survives in glorious condition today. 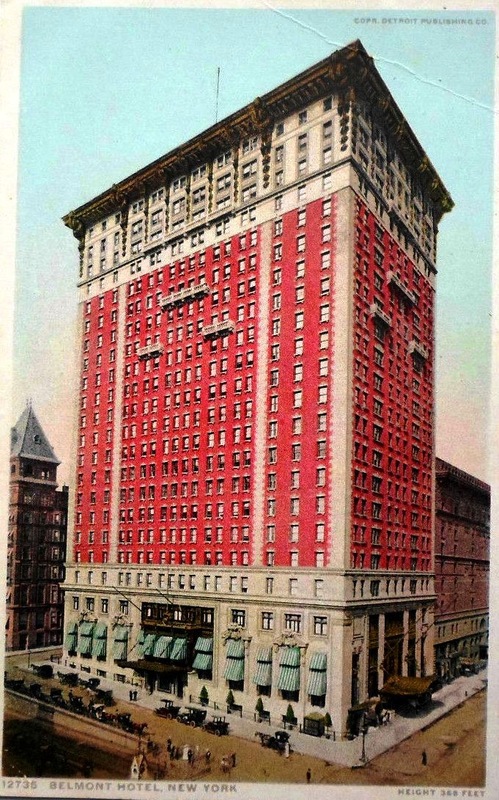 At the turn of the last century, a rather handsome two-story building stood at the southwest corner of Park Avenue and 42nd Street. 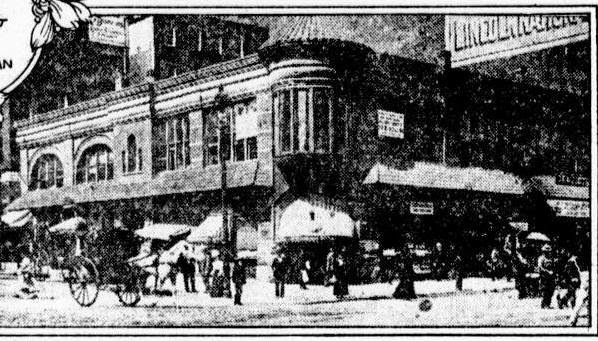 It housed Peter Tivnan’s restaurant and the Hetherington drugstore (and before that, Schoonmaker’s Drugstore). As excavation for the coming Fourth Avenue subway commenced in 1902, the Victorian structure was razed. 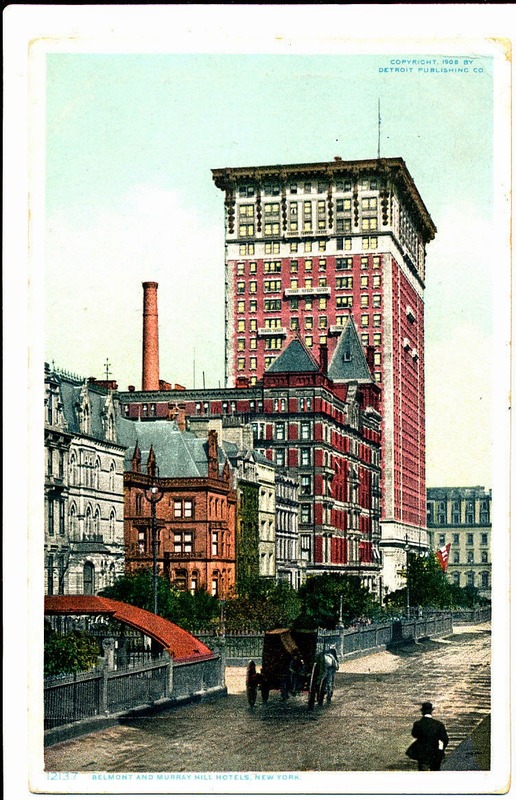 One block to the south stood the massive Murray Hill Hotel which opened in 1884. Before long the aging hostelry would have competition in the 23-story Hotel Belmont. Because of the sharp turn its route had to make at 42nd Street, the subway necessarily had to go under the now-vacant plot. The Subway Realty Company (most of the stock of which was owned by the Interborough Rapid Transit) purchased the land, which it rented to the Hotel Belmont Company at $125,000 per year. 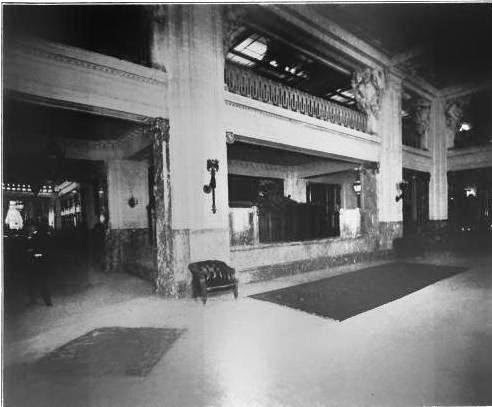 The complex set of negotiations was eased by the fact that millionaire August Belmont, Jr. had founded the Interborough and, not surprisingly, was highly involved in the Hotel Belmont Company. As the subway and the hotel were constructed, August Belmont left his mark in the design of both in the form of a siding for his private subway car. The “Mineola” would cost more than $11,000 to construct and was fitted out like the luxurious private train cars millionaires used above ground. 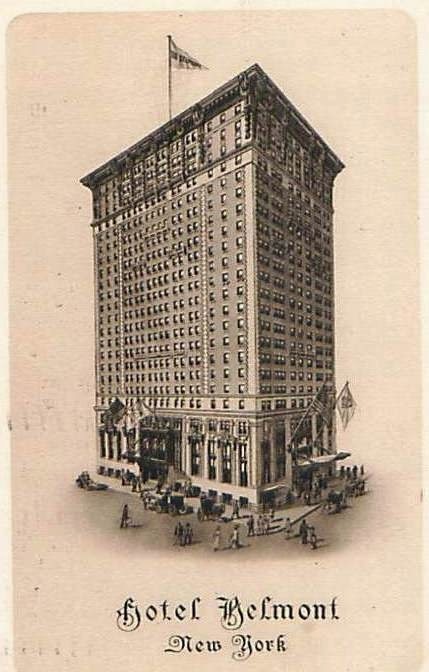 On September 25, 1904 as the hotel began taking form, the New-York Tribune noted “The ground area of the Hotel Belmont contains 22,000 square feet and its cost is estimated at $5,000,000, or $240 a square foot.” The great expense would be understandable when its doors opened for business in 1906. Architecture critic H. W. Frohue found the cornice "rather loud." She walked out of the Belmont that evening and when she had not returned by Thursday, police started a search of hotels, hospitals and sanitariums. Weeks later the mystery of her disappearance appeared to have been solved when relatives in Boston sent word to police “to no longer continue a search for Mrs. Werner, as she was found alive and well,” reported The World. It is possible that the wealthy Boston family simply wanted to put a stop to the uncomfortable publicity. What is certain, however, is that Eva Werner was by no means alive nor well. Five months after her disappearance, the body of Eva Werner was found in the East River by Pier 14. When the badly decomposed body was brought to the morgue only remnants of a brown dress remained; but the label “Slattery & Co., Boston” was still legible. It was enough for Eva’s brother to identify her. 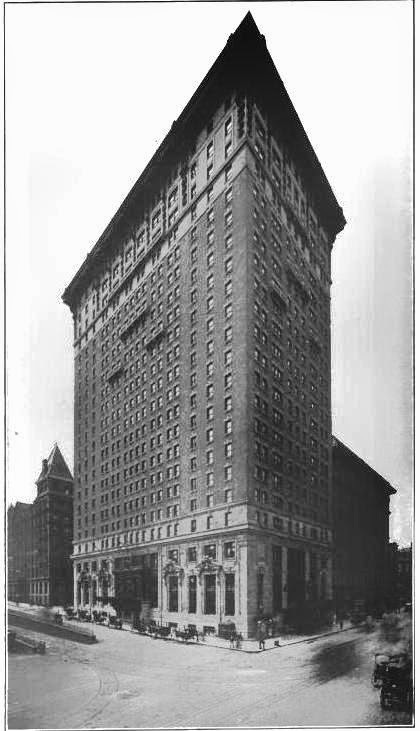 The Hotel Belmont rises high above the Murray Hill hotel in 1908. Park Avenue still boasts lavish mansions. In the suite on the 14th floor next to Schultz were Mostyn Cookson and his wife who were visiting from England. What the Cooksons did not know was that the man in the suite next door was New York’s most sought-after crook, Nathan Levine. And what Levine did not know was that Cookson was a Major in the English Army. Around 2:30 on the morning of July 9 the daring robber climbed out his window and along the three-inch wide stone coping 200 feet above the sidewalk and into the Cookson rooms. After pocketing $2,000 of Mrs. Cookson’s jewelry, he was discovered by the woman. He tied her up and threatened to kill her. In Levine’s rooms the police found two revolvers, two “dark lanterns,” a dagger, several bottles of knock-out drops, and a box of red pepper. As the Major and Mrs. Cookson sailed home on the steamship Baltic on the afternoon of July 9, Nathan Levine was being transported to Sing Sing prison to serve a sentence of 10 to 40 years. 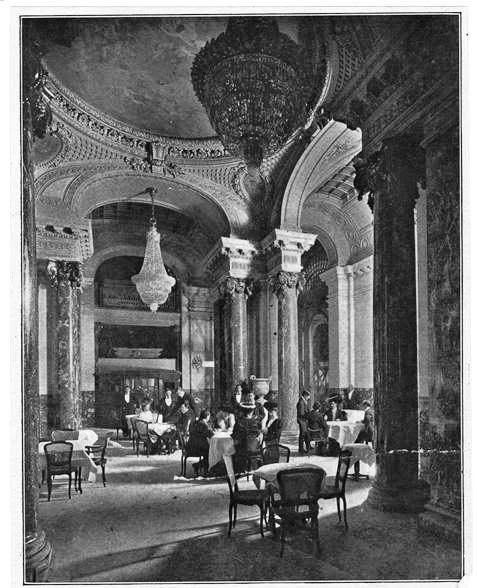 Postcards pictured the Dining Room and the immense lobby fireplace. A bizarre incident occurred the following year when Father Joseph Hirling was hurrying to Grand Central Terminal on April 13, 1909. Mistaking the Hotel for an annex of the train station, he entered. He walked to an elevator but it was too crowded, so he walked into the open door of another one. The elevator was not there. The priest plunged 60 feet down the shaft where he was found unconscious by hotel staff. “For a long time his name and how he met his injuries were unknown, but late last night he recovered consciousness and explained,” reported the New-York Tribune the following day. Despite suffering a broken right leg and several bruises, the unfocused priest recovered. He volunteered to join the U.S. Army but a month later, following a physical examination, received a rejection letter. The rejection apparently ate away at the dejected man and six months later he checked into the Hotel Belmont. Later the Army’s rejection letter was found, torn into many pieces in his room. Muhlensteth threw himself from his 11th floor window that faced the interior air shaft. His body crashed through the glass ceiling of the lobby and smashed to the floor among terrified guests. The coroner arrived within ten minutes, and determined that he had been killed instantly with a fractured skull. The hotel’s proximity to the train terminal made it a favorite for meetings of groups with far-flung attendees. Such was the case when Senator Franklin D. Roosevelt called a meeting “to discuss the coming Presidential campaign and the question of the leadership and principles of the Democratic party in the State of New York,” said The Sun on July 14, 1912. As is the case today, upscale hotels in the first decades of the last century not only saw society functions, suicides and political events; they were the scenes of scandalous trysts. In 1913 the suave Frenchman Jean Millon was chief chef at the Ritz-Carlton. His highly-paid position afforded him the ability to mingle in his off hours among Manhattan’s socially elite. Such was the case on March 10 that year when he dined at the exclusive Maxim’s restaurant. Charles Lehman’s wife was there that night and introduced Millon to wealthy friends, Ernest Eidlitz and his wife. The couple had been married in 1907 and, it appears that the spark that had died in their relationship reignited between the chef and Mrs. Eidlitz. A few days later a basket of fruits and candies arrived at the Millon residence, a gift to the married woman from Millon. 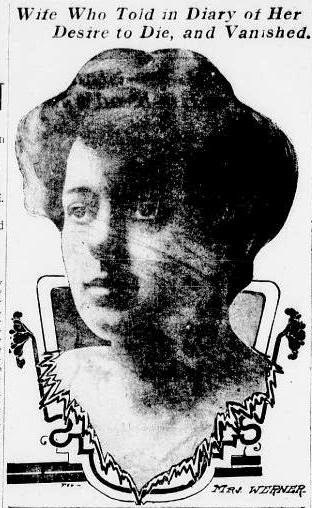 When she hosted her own birthday party on March 22, Millon was “one of the honored guests,” according to The Evening World. The attraction grew. On April 10 Ernest Eidlitz waited until 3:30 in the morning for his wife to return home. Eidlitz put two private detectives on his wife’s trail. It all came to a dramatic conclusion when the lovebirds were followed into the Hotel Belmont on the afternoon of May 27. After once again drinking wine downstairs, they registered as “Michaud and wife” and went to a suite of rooms. Devastated by the humiliating and scandalous press, Eidlitz’s wife fled to Paris rather than appear in court. Eidlitz sued his wife for divorce on June 2, then sued the French chef for $50,000 (a substantial $1.15 million today) for alienating his wife’s affections. Staff at the Hotel Belmont were apparently well taken care of. At the time of Mrs. Eidlitz’s shocking affair the nation was swept with labor upheaval and worker strikes. Earlier that year, in January, Manhattan’s most exclusive hotels were pummeled by waiter strikes led by the Industrial Workers of the World. Representatives of the group told reporters that they “would send their well dressed strikers into the hotels, accompanied by equally well gowned women—their wives or daughters. They figured they would not attract attention and cause disorder by such a method.” Once inside, they would incite the waiters and kitchen help to walk off the job, leaving wealthy patrons at unattended tables. She waited. And waited. And finally went back to strike headquarters alone. Later she found out that not only had the Hotel Belmont staff not participated in the strike; her two associates had been arrested. 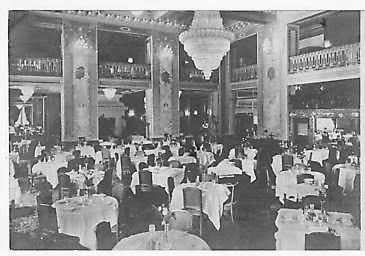 “The two men walked into the Palm room of the hotel and then started to call about them the waiters in the room. They told the waiters who they were and asked that they all ‘get together’ and call a general strike.” Instead they called police. 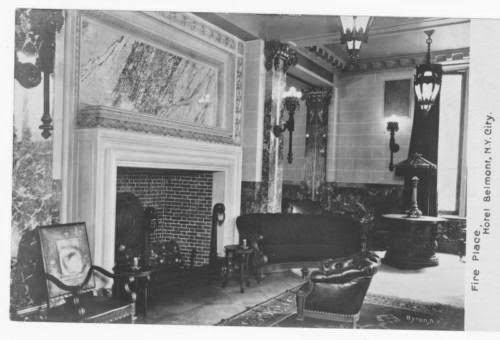 Within weeks the furniture, chandeliers, carpets, fireplaces and other decorative and utilitarian items of the hotel were sold at auction. Among the items was “the historic, rather quaint bar,” as described by The New York Times on June 19, 1930. The move brought a second bid--$27. Silo brought down the hammer and Irving Finn of the Bronx had purchased the striking relic. “Mr. Finn said he would present the bar to a friend who owns a home in the country,” said the newspaper. The hotel would sit vacant and silent for three more years. 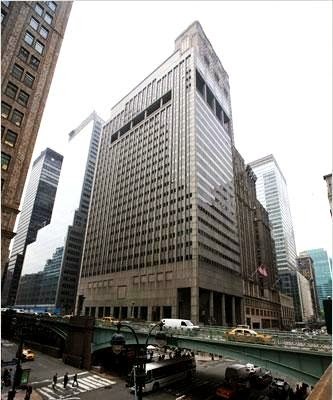 The building that replaced it survived until the 1982 Philip Morris Building took its place, designed by Ulrich Franzen & Associates.